Growing up as a child, I knew the Spider-Man TV theme lyrics by heart. What a great song! 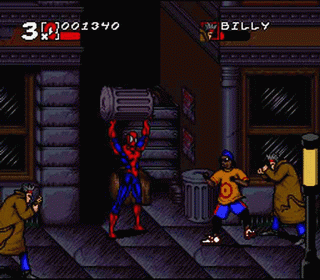 And after playing Spider-Man on the Sega Genesis, I knew that Spidey was capable of some great games. In that game, you had 24 hours to stop a bomb from destroying New York City. You swung all over the place, took pictures to purchase more web fluid (getting more money if you took photos of the boss battles), punched and kicked bad guys, and felt like Marvel's greatest super hero. 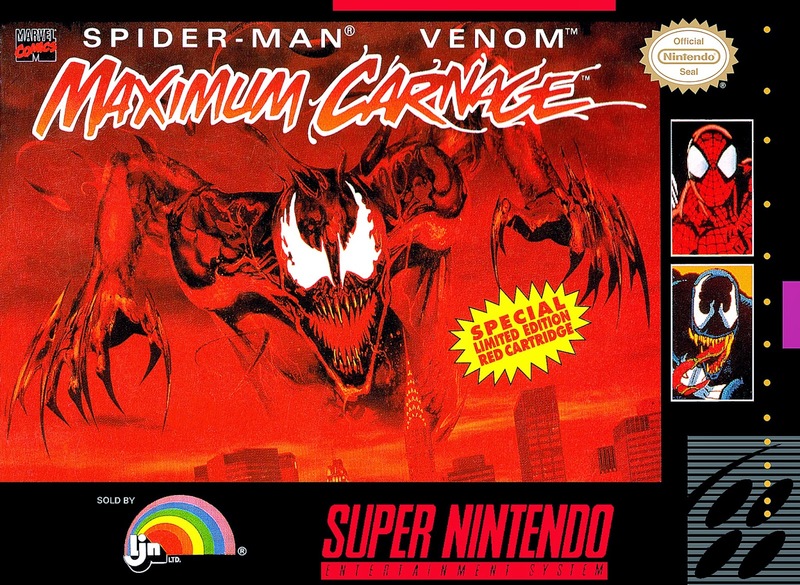 So when Spider-Man and Venom: Maximum Carnage was released, I was ecstatic. The story arc in the comics was great, with Spider-Man teaming up with Venom, Captain America, Iron Fist and a few others to take down Carnage and his band of merry evil-doers.Getting to replay that on a RED cartridge looked amazing! And then you play the game, and you realize that you aren't Spider-Man at all, you're just some generic beat-em up character wearing a Spider-Man outfit. It might as well be Axel or Blaze under that costume. Seriously? I have to resort to trashcans? Why can't I just throw them on webbing or swing around them? My main gripe with this title is that you don't feel like Spider-Man at all. Spidey swings all over the place, from building to building. In this game, you walk to the right and punch bad guys. Sure you can use your web to swing...about five feet off the ground! You can use your web as a shield, but that's it. That's not a Spider-Man game. "Oh but you can be Venom!" I hear you cry out. No, you control someone dressed up as Venom. It's a competent brawler, but it doesn't make me feel like the characters I play as. I realize there are some stages where you do climb buildings, but Spider-Man's greatest powers shouldn't be confined to one stage. The X-Men games on the Genesis work because you have access to your powers throughout the entire game. Imagine if you could only shoot laser beams or pop your claws on certain levels. You wouldn't remember that game fondly. If Acclaim had put a little more creativity into this game, this could have been something amazing. Make better usage of Peter Parker's web-slinging abilities throughout all the levels. Make the levels taller so that I get the feeling of being able to swing anywhere, instead of limiting me to walking across the street to fight. But instead, they settled for a generic beat-em up and depended on the license to sell copies.